Hi Sylvie, this is gorgeous and I love the image. Fab colours and papers too. Was waiting for one of you to post as I didn't know what the theme was this time so will be on to it tomorrow. 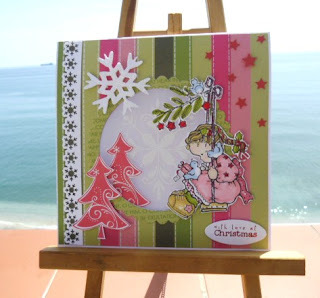 Gorgeous card Sylvie, I like the design, the sweet image and the colours. Gorgeous card Sylvie. Love the sweet image and the fab trees. Adorable and gorgeous too Sylvie. Hey Sylvie - your card is gorgeous and I love that little girl. She is the sweetest thing. You keep making and I will keep visiting! What a stunning card Sylvie, the aperture works so beautifully with the sweet little image. Lovely card Sylvie..great image and fab colours...Kerry X.
Hi Sylvie this is absolutely beautiful I totally love the image, colours, design and the aperture, superb card. This is so sweet and totally stunning in its details!